UDPATE: March 1, 2016 ~ I’m Adopted! My name is Eden. I’m a 6 year old Toy Poodle X. I almost died a couple years ago, but the humans at VetsToronto made me all better. I spent almost 3 months with them getting healthy again. It’s been good to be back the past couple months and see all the people that saved my life, but I really do want to find a family to call my own. I love to play and boy oh boy I love my walks. I could walk and walk and walk and walk and meet all the new people and pets out there. I’m very gentle and kind but outgoing and just curious about life. The humans at the clinic say I haven’t yet found my bark, but they’re sure it’s in there somewhere. I recently received my spay and vaccinations to keep me healthy because I never had them before. I had all my teeth removed when I was here at the clinic last time because my mouth was rotting so badly and making me so sick, but that doesn’t stop me from being a dog just like all others and I’m very strong and healthy now. All I need is a family to love me. A place I can call home and know I’ll be there for always. I’ll be so loyal to you if you adopt me into your life. I promise. I’m available for adoption for $100 and you can email info@vetstoronto.com for an adoption questionnaire. Hello. My name is Patches, I am Canadian and I’m available for adoption at VETS Toronto! I know everyone seems to want to adopt dogs from other countries, but it’s super cool to adopt Canadian dogs like me too! I am also in need of a family to call my own. 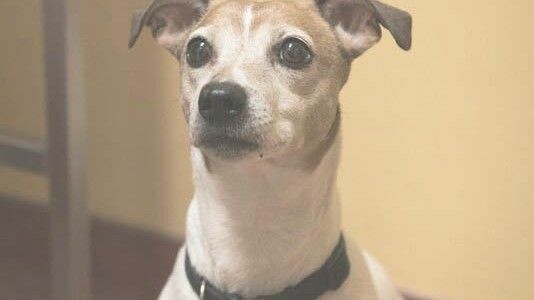 I’m a 7 year old female Jack Russell Terrier and I live up to my Jack Russell Terrier breed. I earn a place in the hearts of every human I meet!I’m so very smart, loyal, athletic, high energy, determined and intense. I am … Jack Russell Terrier!!!! I’m so outgoing that I require full participation with whomever adopts me. I hope you’re a busy, outgoing, active human, because vigorous daily play sessions, especially ball chasing, is what I’m passionate about – even to the point of obsessive. I am … Jack Russell Terrier!!! !Too little exercise, too little companionship, and too little mental stimulation is not something I’ll even consider. I’m a small dog with a big attitude. I am … Jack Russell Terrier!!! !If you’ve ever been looking at taking on a hobby with a new pet kid, I’m your girl! My energy level would be particularly useful if you wanted to take the time to train me in agility or flyball, two activities the humans at VetsToronto say I would excel at. It could be a fun hobby we could learn together and bond over don’t you think? I get to leave the clinic on weekends to spend time with my foster Mom Megan. She says I’m happiest in the company of humans that I feel love from and I’m good either snuggled up on a bed or curled up at your feet, but I’m always on the lookout for a good game of ball chase, because playing is my favourite thing to do. When it’s not playtime, I’m happy to make my own entertainment, either by tearing through the house at breakneck speed like a drag racer, or staring at you for what seems forever until you’ve had enough and join me in playtime, or as a last resort, by barking at you and then running off to try to entice you to play. The bottom line is, if you make me part of your family, you have to have a sense of humor to appreciate appreciate how amazing I am. I am … Jack Russell Terrier!!!! My $100 adoption fee comes with 30 days of free pet insurance. I did have a lot of lumps and bumps removed when I arrived at VetsToronto and sent out for testing to ensure I was healthy, which I certainly am! I also received my spay and some of the important vaccinations to ensure I stay healthy and strong. Please email info@vetstoronto.com for an adoption questionnaire. My name is Rascal. 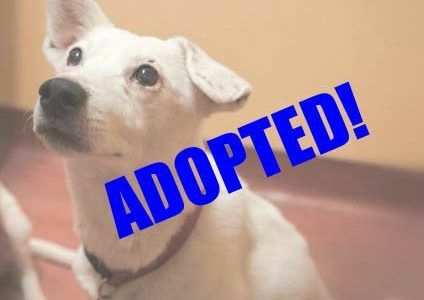 I’m a 9-year-old Jack Russell Terrier X.
l may not have an exciting story like all those rescue dogs being brought in from all over the world, but I’m just as deserving of a home to call my own because I don’t have one right now. I’m so energetic and hoping to find a busy family that wants to include me in their lifestyle. A running partner would be awesome because I can run and run and run and still not be tired. On the weekends I get to go stay with my foster Mom Megan. We run on the Beach(es) boardwalk and she says I’m fast like the wind and can keep up with her no matter how much she challenges me. I’m a real people pleaser and I love when I make humans happy. I get along really great with my best dog buddy Patches, but I’m so afraid of other dogs and my insecurity makes me jump and bark. I’ll be honest, I’m not a fan of cats either. The humans at VetsToronto say with proper training and socialization, I would be better around other dogs. I LOVE all things toys. I’ve been spoiled with new toys so much since being here that I can’t ever decide which toy I want to play with so I go from toy to toy, to toy. I really like to chew my toys though, so I have to be sure to have sturdy strong toys I can’t rip apart. I’ve mastered the skill of stuffed animal destruction in 2.2 minutes. Once I’ve had my run and play time, I’m content sitting with a human and cuddling and snuggling. I’m super sweet and when you’re happy, I’m happy. I really like human attention. I had some really rotten teeth that the veterinarians at VetsToronto removed from me when I first arrived, so if you promise to brush my teeth every day, you’ll have a great start on my dental health. I’m also neutered and received my most important vaccinations. I have a $100 adoption fee and come with 30 days of free pet insurance. Do you have room for me in your home? Please email info@vetstoronto.com for an adoption questionnaire. 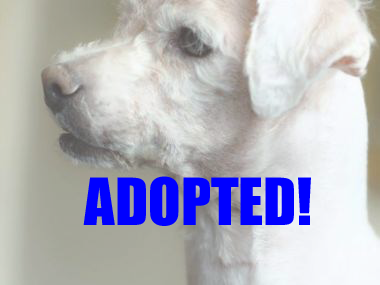 UPDATE March 1, 2016 ~ I’m Adopted! My name is Muffin. I’m a 110-year-old female Shih Tzu X, looking for a home to call my own. I have just experienced what going for walks is the past 2 months, as I’ve spent very little time outside in my 10 years. The first month the humans at VetsToronto had to carry me around the block because I just couldn’t understand this walking thing …. now, I’m happy to walk 1/2 a block before I expect to be carried the rest of the way. I’m in awe of everything I see and all the people I meet. Everyone thinks I’m so cute and they always talk about my tongue that is happiest hangin’ out, outside my mouth. Makes me even more adorable doesn’t it!? I’m so happy to just be a lap dog, and get cuddled and snuggled. I have no demands and am most content just being with my special human, if I could find a new one to call me their own. I just learned all about housetraining, and I take it very seriously. Everyone at VetsToronto says I’m proof you can teach an old dog new tricks! The veterinarians say I’m very healthy, and I’ve received my spay and a couple of the important vaccinations to keep me healthy now that I’m going outside. If you want me to come live with you, please email info@vetstoronto.com for an adoption questionairre. $100 adoption fee applies and I come with 30 days of free pet insurance. My name is Toto and I’m a 9-year-old highly, highly, highly affectionate girl and I’m available for adoption. I am sweet and kind, and I get along with every human I meet as well as all other dogs and cats. I just love everyone and if you are up for some rubs and cuddles, I’m the girl for you. I am a lap cat through and through, and I could get attention for hours on end and still not be satisfied. I’m happy to get right up in your face and demand more and more and more attention because I’m so full of love to give I can barely stand it. When I see any of the humans at VetsToronto I run, yes run, not walk, run, straight up to them and start weaving between their legs showering them with affection and leaving my fur on their scrubs, but they don’t seem to mind. They are always laughing at me and they say I have the quirkiest personality and I’m very much a “cat dog” whatever that means. They can call me whatever they want as long as the kisses and cuddles never stop coming. Nothing phases me. I’m just in constant purrrr mode and there’s no turning it off when I’m in the presence of humans. I’m looking for a furever home where I can be love and be loved. Is that really so much to ask for? My adoption fee is $100. I did receive my spay and vaccinations as well as some dental work that I really, really needed badly. Email info@vetstoronto.com right now for an adoption application … hurry, I’m waiting for you.